Being a fan of computer cases, especially Antec cases, last year when I was building a new system I came across an excellent price on an Antec Atlas 550. For reference I suggest reading my original review: for this piece I’ll cover the differences between the two. This was a new model, the second in the Antec server line, a reworking of the Antec Titan that I had enjoyed so much. At the time the Atlas had the same 550 watt power supply (the Titan now comes with a 650 watt power supply), but had reduced the overall dimensions significantly. This was accomplished by removing two internal hard drive bays and shrinking the width to accommodate only ATX motherboards and not extended ATX. As well the front hinged door was removed and a fan grate added to the side panel, but these four items were the only changes. I loved the Titan so the Atlas seeemed a shoe-in. Once I had the Atlas on my work table and started installing components did I realize what those changes meant. When they shortened the width for ATX boards they went a little too far: in the picture above you can see that an ATX board fills the space completely, with nary a cables width between the edge of the motherboard and the drive bays. You cannot install a large video card such as a Geforce 8800 GTX or Radeon 2900XT. That pretty much killed my use for this chassis. The two other changes are welcome additions. The side fan grate allowed me to put a low RPM 80 mm fan and vent some of the heat from my Geforce 7900GT that I installed. I didn’t miss the hinged door on the front panel at all. I found the Atlas to be much quieter than the Titan, possibly because of the reduced space. Overall the built quality was solid and excellent, like practically all Antec products. 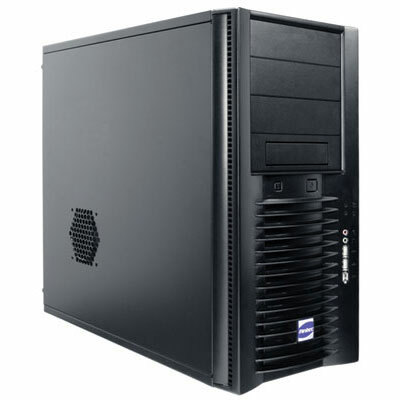 I’m still miffed at this being called a “server” case: the hard drives can only be accessed once you remove the side panel, pull off the front bezel and loosen two thumb screws from a medal door that doubles as the dual 92 mm fan grate. 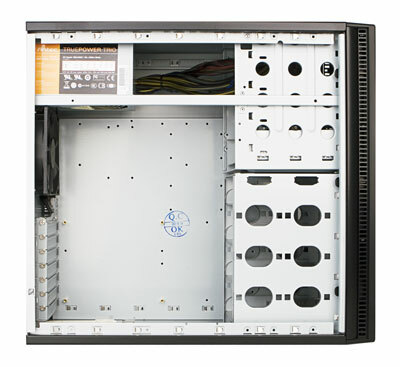 Antec’s removable drive cage from the 3700AMB is much more elegant. Antec, please develop a hot swap drive cage! Antec products are solid, reliable and affordable. The Antec Atlas for me overall was a disappointment, as the available motherboard space was very restrictive and the hard drive bays remain difficult to access.